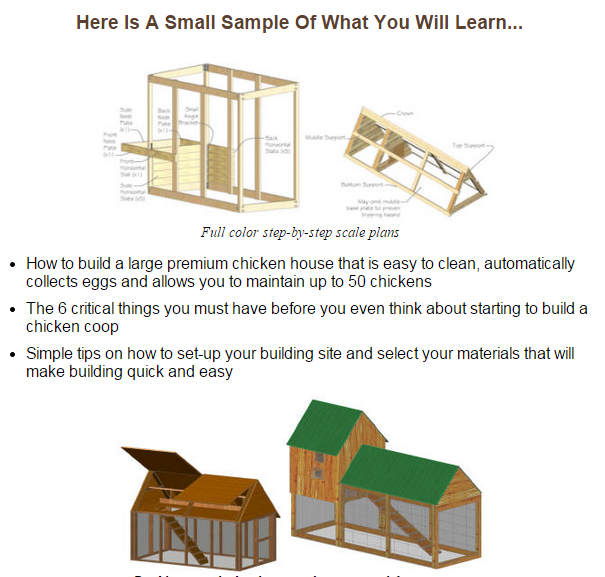 One of the main things I learned while putting this “Building A Chicken Coop Review Site” together, is that the chicken coop is not going to build itself! And if you don’t have a PLAN before you start, then you are headed for frustration! Or you can decide, “Well, I Can’t Finish Before I Start”, and begin planning a well-organized project. Where do I live? In town or a rural area? Let’s assume that either you live in a rural area or you don’t have a city ordinance to prevent you from raising chickens. Let’s see if we only want to raise a few as a hobby or possibly by a child as a 4H project, or if we want to start a backyard project, to begin with to see how much time, money, and effort it takes to supplement our current income with the thought of growing it into a commercial operation. What type of chickens do we want to raise? There are layers, fryers, broilers, biddies, game chickens, and bantams along with specialty breeds. Naturally, we want to investigate the market price of each along with the cost of operation for each. With this, we decide which is best for the family. Now we must decide where to put the coop. If possible, let’s select a high-level spot to avoid having to do any grading. This can be very costly. Let’s decide how we will service the facility. We need room between the coop and other buildings. Supplies must be brought in and the house and yard must be cleaned on a regular basis. Let’s stay as far as is reasonably possible from the house because of the odor that comes with chickens. We also don’t want any water that drains toward the house for the same reason. How much are we prepared to spend on the project, to begin with? We can save quite a bit of money if we do everything within the family, but if you are the only one to do the work, you may want to hire a professional carpenter. Preferably one that has built chicken coops before. If this is, in fact, the case, I am quite sure you can save quite a bit of time and money by getting a set of detailed plans and drawings. I would suggest if this is what you decide to do. Look at the ones you can find easily. Before you buy a set, I have reviewed several and I believe you will find the ones by Bill Keens the best on the market. They are easy to understand, have several to choose from, and have all the necessary materials along with hardware listed. They explain all details such as light and ventilation. Being raised on a farm, I know the location of any type of housing for chickens is very very important! There is a most unpleasant odor connected with chicken droppings. You must also be doubly sure no water from these chickens drains toward your house or any area that children play. 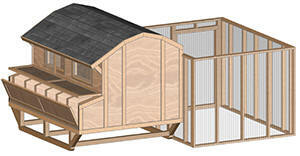 Your storeroom for supplies for your chickens can be attached to your chicken house or coop or at a remote location. Remember that it’s necessary to have one. In either case, you should plan to leave drive space between it and other buildings for ease of servicing the project. This drive will be used regularly to clean the house. Before you make your final decision, you should decide what type and breed of chickens you plan to raise. 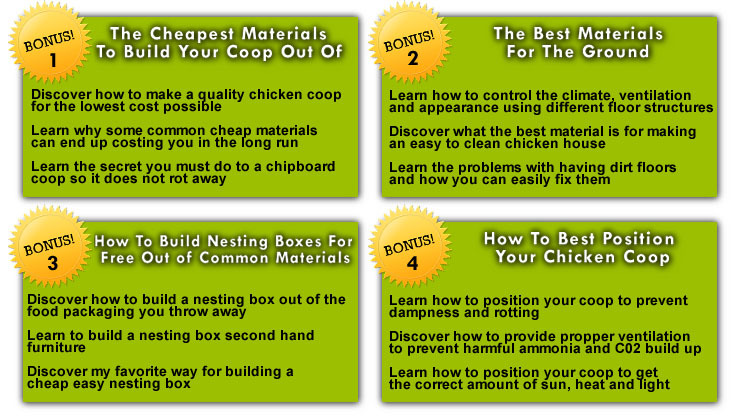 There are several places you can get accurate information on different breeds of chickens. Be careful, if you select bantam or game chickens, especially bantam. They are the most beautiful, but they fly. You will have to raise the height of your fence or in special cases, it may be cheaper to put a top on it. 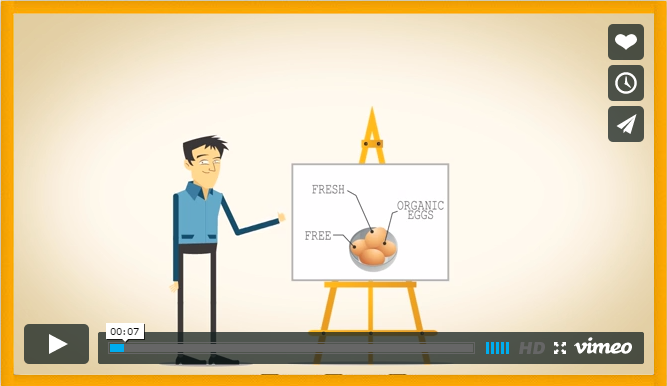 Decide if you want layers, fryers, biddies (baby chicks), breeders or one that can be used for quail. You will also be glad you considered the ease of operation of the project. Predators are a problem for all types of chickens. Be sure you place the necessary controls for them as you build. As you select plans, you will save both time and money if you get plans that give a list of all the materials you need for the coop. Remember it takes your time each time you go to the supply house. You may intend to do the complete project alone, but after you begin building a chicken coop, decide you should have engaged the help of a professional carpenter. 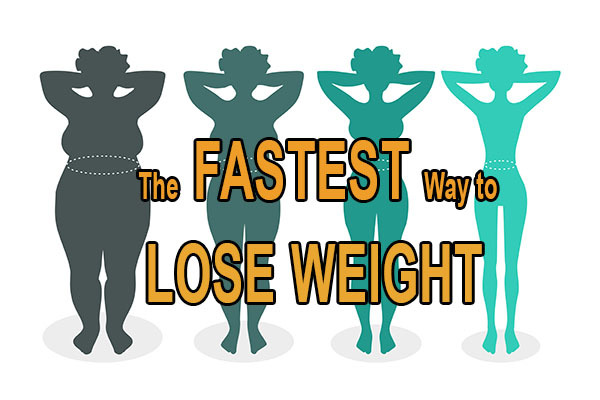 It will be best if you make this decision before you begin. I would suggest you decide how much money you can or want to spend on your project. Many times a few additional dollars, in the beginning, will save many at the end. 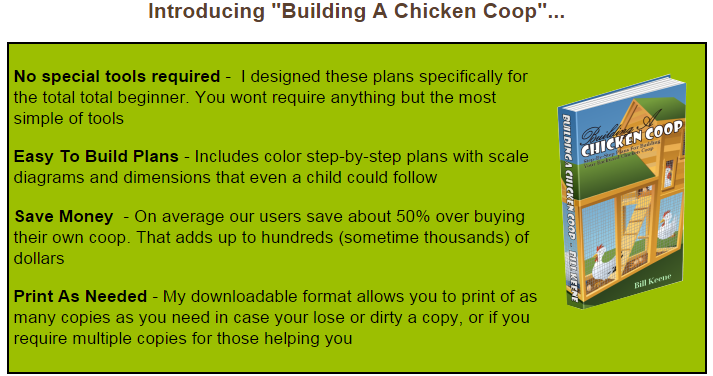 If you decide to purchase building plans, after you look at several, I suggest you take your last look at “Building A Chicken Coop ” eBook by Bill Keenes. The location should be well thought out. Remember, water flows downhill, so if you can find a high flat spot the size (or larger) of your chicken coop and chicken yard combined, that will be best. The chicken droppings or manure does not have a pleasant odor so you don’t want it close to your house and you don’t want it draining toward your house. If you plan to have a storeroom attached to your chicken coop, be sure you have drive space to bring your feed and supplies. It will be best to think about the ease of cleaning and disposing of the droppings BEFORE building a chicken coop. Remember, this will be some of the best fertilizer for your lawn and special shrubs and flowers. You should decide how much it will cost for the materials and how much you can allocate to the project. Will this be a recreational or commercial project? In other words, is this just a fun project that you may decide you no longer enjoy after a few years, or are you building this chicken coop to make your living with? Knowing this will help you decide the quality of the materials you buy. when building your chicken coop. There are also other considerations such as, fryers or laying hens, or biddies. It may cost a few dollars more, but you want to think at the beginning about “Ease of Operation”. They must be fed, watered, and cleaned up after. If you are going to purchase building a chicken coop from pallets or building a chicken coop out of pallets, be sure to select one that has a list of all materials needed as well as supplied to complete the project such as nails, bolts, screws etc. Building a chicken coop can be rewarding. There will be a great deal of personal satisfaction after you finish of knowing you did it yourself. 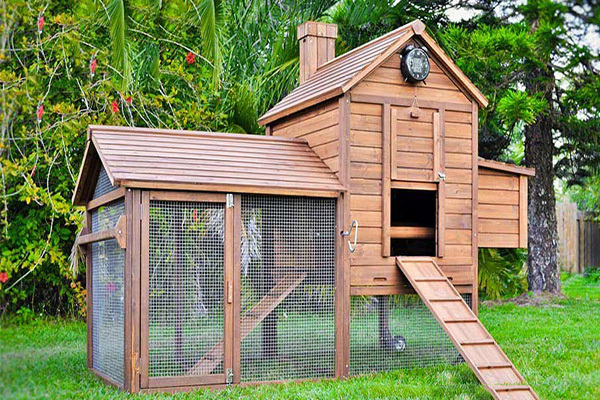 I hope this quick article has given you some helpful ideas to help you with DIY chicken coop ideas. Hi, I am James, thanks for visiting my review post. 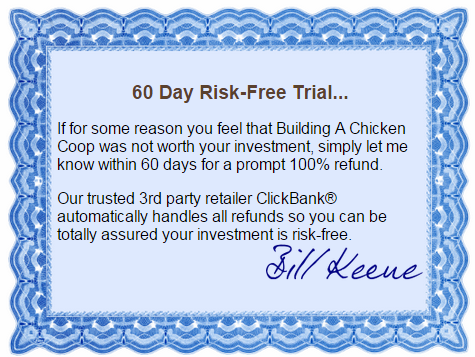 If you are looking for an honest Building A Chicken Coop Review, then you have come to the right place! When it comes to building chicken coops, I’m no expert. In fact, far from it. The reason I wrote this post is to provide you with the information you need in order to make the right decision… I hope you find this post helpful! Feel free to place a comment with any questions! If you are a DIY enthusiast and would like to save money, rather than buying a pre-made coop, you should invest in this Building a Chicken Coop program. In our opinion, the guide offers great value for money. 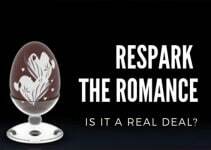 Besides, if you don’t like it, you can always request your money back thanks to the 60-day money back guarantee it comes with.